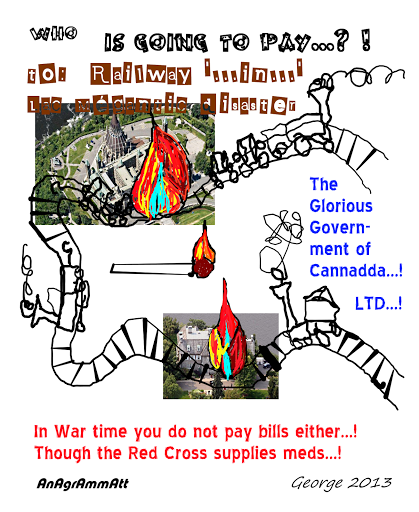 … Railway in Lac Mégantic disaster – anagrammatt – who pays…!? well get all you can before they go Bankrupt, even if it not be complete…! Montreal, Maine & Atlantic Railway Ltd. has filed for bankruptcy protection in both Canada and the United States, setting the stage for a massive legal battle as lawyers for Quebec victims of one of North America’s deadliest rail crashes target the railway’s parent and the oil companies involved. The railway sought relief from creditors Wednesday in a Maine court under Chapter 11 of the United States Bankruptcy code. At the same time, Canadian affiliate Montreal, Maine & Atlantic Canada Co. filed an application under Canada’s Companies’ Creditors Arrangement Act in Quebec Superior Court. …well get all you can before bankruptcy…!!! …noo…! folks…! a train that goes by “in their minds” in front of 24 Susses and Parliament Hill, crashed front on in front, and “ignited”…! …carbonized 2/3 of them all, and “dead do not talk nor claim anything”…!!! …the train line filled for bankruptcy, and the Government of Canada is paying off all…! Sounds like a similar story to me…!!! ← …who has done more for "NIGERS, BLACKS"…! Oprah sure does fight for them…!